If there is one thing about flagships that is certain: give it enough time, and the prices will fall. 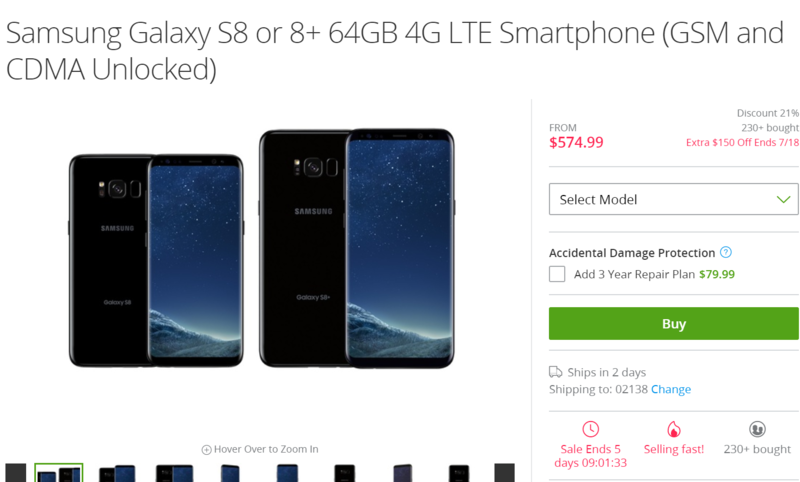 The Galaxy S8 series may have started out at $750-$850, but today over at Groupon you can pick one up for just $575-$675. That's $175 off the launch price and $150 off the price at most other retailers. Groupon's store is a pretty great place to find deals, and this one lasts for the next 5 days. There's no telling if the stock is limited, though, so you may wish to consider things sooner, rather than later. If you're in the market for one, then you've probably read our review, in which we praised pretty much everything about the phone except the location of the fingerprint scanner, Bixby, and the price. It's a great phone. We saw the price get down to $580/665 just a few days ago, but that was the unlocked dual SIM non-us variant, which meant warranty service was a definite question (with the likely answer "no"). The closest the US version has been to this price was Best Buy's promotion for a $200 gift card a couple weeks back, or Samsung's trade-in for $525-625. The latter might not be the best idea given how Samsung's handled things, though. This is one of the best prices we've ever seen for a US unlocked Galasy S8 or Galaxy S8+. It's worth considering if you've been on the fence about it. Frankly, I'm pretty tempted, myself.